For pricing and ordering information please click here for a copy of the purchase order. 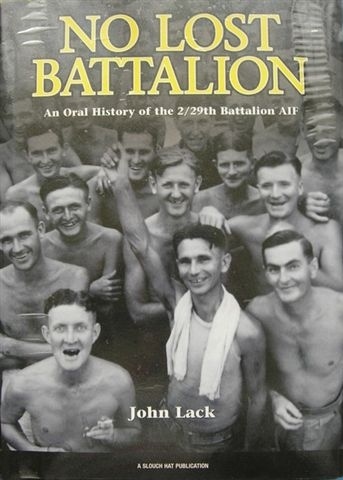 An oral history of the 2/29th Battalion by John Lack, published in 2005. It's formative years, Malaya and Singapore, and the years as prisoners of war of the Japanese. The campaign and POW diary of Bob Christie 2/29th Battalion A.I.F 1942-1945. Written by R.W. Christie, edited by Associate Professor John Lack. First published in 2010. A very readable and informative account of the dedication, compassion, bravery and ingenuity of the 106 Australian doctors who were POW's of the Japanese for three & a half years with some 22,000.00 fellow Australian servicemen. Wal Snowden's story of his escape from Malaya to Australia via Strait of Malacca, Sumartra and Java with 14 other 2/29th Battalion men and after eluding capture following the Battle of Muar and the fall of Singapore. Edited interview with John Lack. We have produced PVC Velcro Backed 2/29 Battalion Association Morale Patches, they will attach to any Velcro Hoop surface. To compliment these great Patches we have teamed them up with 5.11® Flag Bearer Caps in 3 great colour schemes, Black, Storm (Grey) and Multicam. These caps already have Velcro Hoop on the front panel for quick and easy attachment, as well they are one size fits all with elasticised head band and Velcro adjustment strap at the back. For Orders please inbox the Facebook page. Get yourself a Cap & Patch, it would be a great spectacle with all of us wearing them on ANZAC DAY in the March. 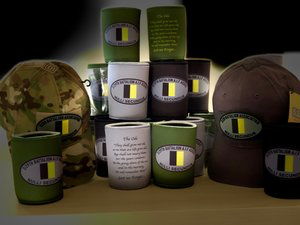 Brand New Battalion Merchandise, Yes you've got it in One, The Beloved STUBBY HOLDER, 3 Great Colours, Great Design, Double Stitched for longevity, All round great quality product. $10.00 each + Postage. Contact our Merchandise Co-ordinator Ron Lovett to purchase The Hottest Stubby Holder in Australia Today…Just a Click of the Mouse at the top of this page to download the Purchase Order Form which has Ron Lovett's details. Or alternately you can contact us via our Facebook Page and we can make arrangements for your purchase.